FILE: A team carries the body of an Ebola victim in Freetown, Sierra Leone. At least 70 percent of the country’s burials are conducted safely, the World Health Organization reports. Transmission of the Ebola virus is slowing in West Africa, with Liberia and Guinea meeting December 1 goals that at least 70 percent of the sick have been isolated and at least 70 percent of burials are handled safely, a World Health Organization official reported Monday. "Many communities are changing the way that they live," Bruce Aylward, WHO’s assistant director general, said at a news conference in Geneva. 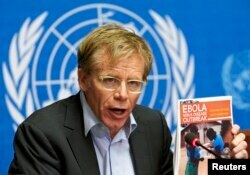 Liberia has experienced a steep drop in the number of new cases and Guinea has seen a leveling off, Aylward said. But in Sierra Leone, the third most-affected country, the rate has been increasing since October 1, when the United Nations health organization set its targets. However, Aylward said the country was likely to contain the outbreak, with increased surveillance and new treatment facilities expected to open within a few weeks, easing the bed shortage in its western region. "Capacity at the district level is strong and getting stronger in Sierra Leone, and that's why I think the prognosis is actually very good," he said. Questioned about a mismatch between resources and needs, Aylward acknowledged that the situation is "not perfect." The Ebola treatment units are big facilities, some with 100 beds, but often are far from where prospective patients live. In Guinea, he said, the virus had been detected in nine prefectures in early October and now was in 16. But major treatment facilities are only in two locations: Conakry, the capital city, and Gueckedou, an area in the forest region where the outbreak began almost a year ago. "The big thing is getting the geographic build-out right," Aylward said. While there has been progress, that’s not good enough to stop Ebola, Aylward said. "There is no room for optimism as long as you are dealing with an Ebola virus." Ending the epidemic will require isolating 100 percent of the sick and safely burying 100 percent of the dead, he added. It also will take sustained vigilance. The slowdown in the spread of disease can create a dangerous complacency, Aylward said. On a recent trip to Liberia, he said he saw fewer containers with chlorine bleach solutions for people to wash hands and saw "people cramming into taxis again." "Now you’re going to need surveillance teams in every single prefecture" to trace infected people's contacts, he said, to systematically "hunt the virus rather than be hunted by it." Some material for this report was contributed by Reuters.